A black and white negative of a portrait of Mr. John McIvor. Mr. John McIvor (1916-1984) was born at Edinburgh, Midlothian, Scotland, on March 6, 1916 and came to Whitby in 1930. He was employed for 22 years at Herb Robinson Automotive in Whitby. He served as President of the Royal Canadian Legion Branch 112 in 1964-65 and was a member of the Whitby Lions Club. In the 1970s he was vice-chairman of the Whitby County Town Carnival. John Mr. McIvor died at Oshawa on June 24, 1984, and was buried at Groveside Cemetery, Brooklin. 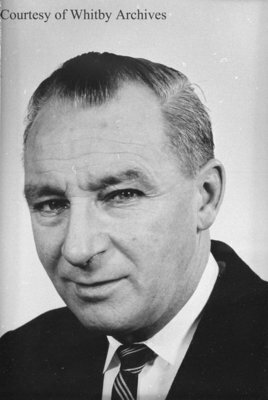 John McIvor, 1965, Photographer Unknown. Whitby Archives A2016_017_038A.